SKUGGSJÁ translates into ‘mirror’ or ‘reflection’ in the Norse language. By highlighting ideas, traditions and instruments of their Norse past, SKUGGSJÁ tells the history of Norway and reflects relevant aspects from the past into the present day. In light of they reflect on themselves as a people and nation. 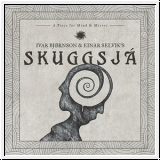 In a magnificent tapestry of metal instrumentation, a wide variety of Norway’s and Scandinavia’s oldest instruments as well as poetry in Norse and Norwegian, SKUGGSJÁ is a fusion between past and present, both lyrically and musically.